It’s tough to get rid of the smell of smoke in your home. Whether it’s from a smoker or fires from outside of your home, either way, the stench lingers and not to mention smoke isn’t good for your health. Air purifiers can be a cost-effective and actionable way to get rid of that nasty, lingering smoke smell. And, many of us don’t want to have to break the bank to do it. 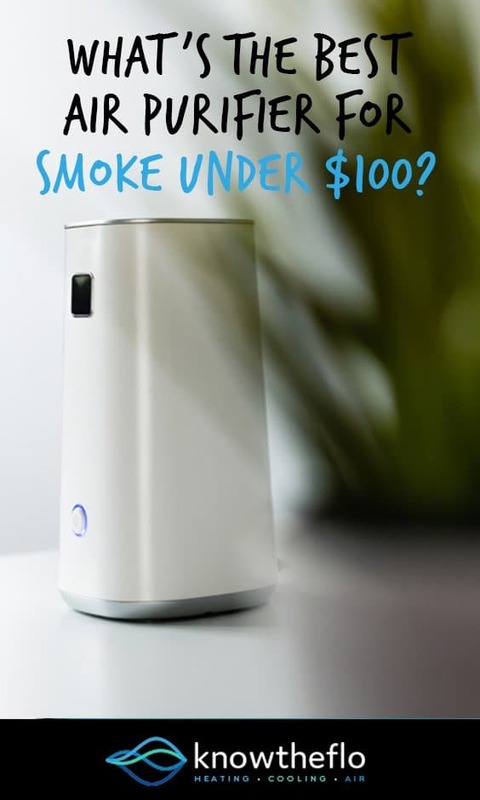 Luckily, in this article, we give you the results of our search for the best air purifier for smoke under $100. Below is our list of the top 5 air purifiers for smoke under $100. Personally, we recommend the PureZone 3-in-1 given its overwhelmingly positive feedback which speaks volume to its quality. The unit has multiple filters, is quiet, has a good warranty and the company PureZone is known to have great customer service in the case of any defects. 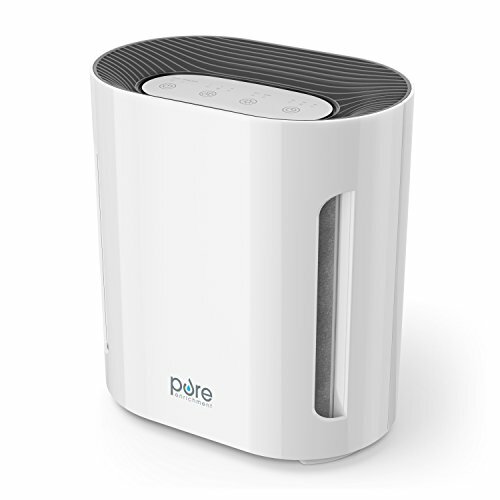 The PureZone 3-in-1 Air Purifier is a great air filter for smoke and other allergens and dust. It has overwhelmingly positive reviews and has been used by purchasers for a number of different purposes such as plant smells, dust as well as smoke. Those who used this for clearing the smell of smoke had previous issues with cigarette smoke, cigar smoke and smoke from nearby forest fires but found this a very good filter for clearing the smell, and reducing and sore throats that had arisen because of said smoke. 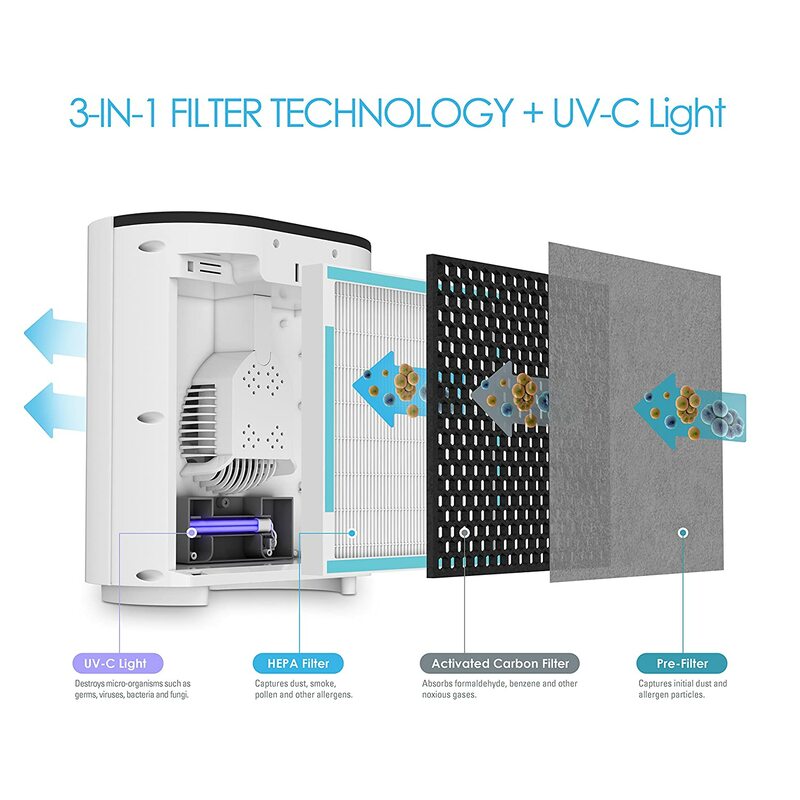 The unit itself has a number of features including a 3 filter system which has a pre-filter, activated carbon filter, and a HEPA filter which in itself is said to eliminate 99.97% of dust, pollen, and smoke. It comes with three speeds and a timer which can automatically shut the unit off after 2,4 and 8 hours. There is also a filter light indicator which lights when the filter needs to be changed and a UVC Light which helps to kill off extra germs and bacteria. One feature which is a common problem for many household products is the bright lights of the unit which can make it hard for people to sleep when the units are being used in the bedrooms. The Purezone has a nighttime feature which is handy, but in some ways is a gift and a curse at the same time which we will explain below. The PureZone also comes with a 5-year warranty and the customer services has very good wraps, so that is always comforting when purchasing a product. This unit is super highly rated by purchasers and is packed full of features. 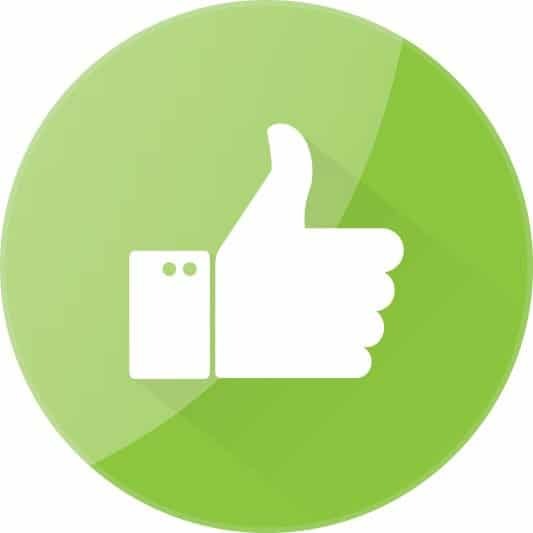 The warranty is long and the customer service is great and the unit works extremely well. The nighttime setting though handy for dimming the lights and making the machine quieter, affects the power and amount of purifying the unit does, setting it to a low speed, so if you need a high powered setting at night, but don’t want the bright lights, you might need to get some tape to put over the lights. 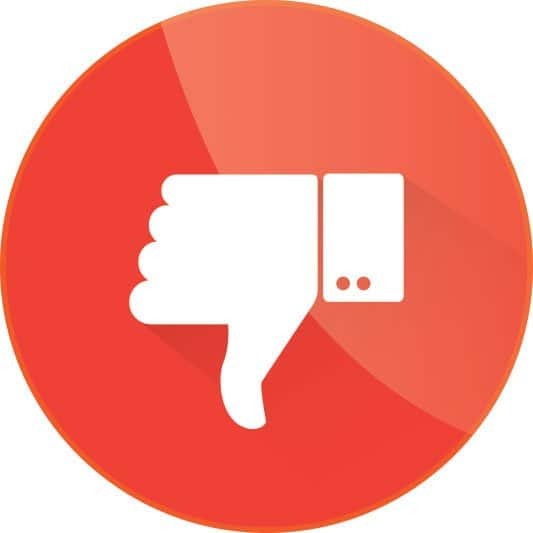 The unit was, by a number of purchasers considered to be loud on the high setting, and occasionally some people had issues with the on-off button playing up, which were usually promptly taken care of by customer service. The unit is also small, so, an excellent unit for smaller rooms, but those with large rooms might want to look at a bigger, more powerful unit. Anyone looking to get that smoke smell or dust and allergens out of their room as it is a quality machine, but probably for those with smaller rooms. The GermGuardian is a pretty good unit and has worked for many people looking for an air purifier to get rid of smoke odor. It has a number of features though not quite as packed as feature packed as the PureZone. This unit comes with a HEPA filter which is meant to capture 99.97% of dust and allergens and also comes with a UV light with titanium oxide to kills germs. Like a number of purchasers have mentioned though it is hard to tell without proper testing whether the UV actually does much. 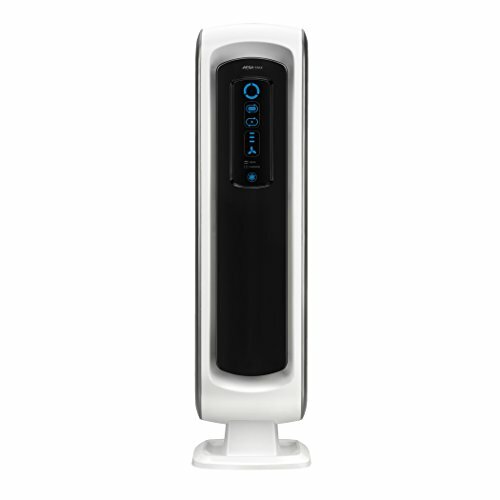 Unlike some other air purifiers with the same feature, it actually has a light which indicates the uV light needs replacing, and the light is actually replaceable. It also has a filter change indicator light, which lets you know that the filter needs to be changed. This is a popular unit that for the majority of purchasers does a great job removing smoke, odors, and allergens and is highly rated by a large number of purchasers. Chances are you won’t go wrong with this purifier. This unit does not have a timer, so you will manually have to turn the unit on or off. Along with that, there is no night time mode, so if this is in your bedroom you might have to cover the lights if lighting bothers you at night. Occasionally the unit has succumbed to a burnt plastic smell and is not UL Listed, so this is something to be aware of. Someone looking for a somewhat simple but effective air purifier for smoke or dust. 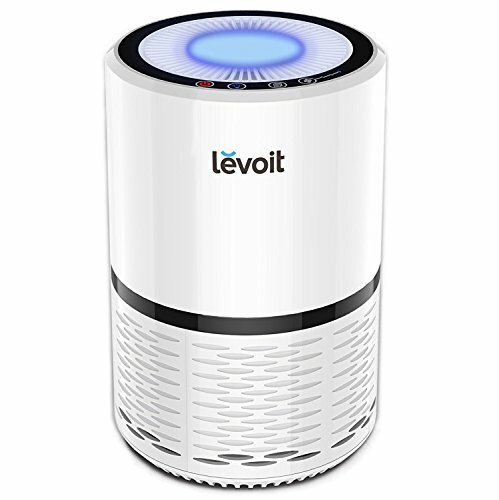 The Levoit LV-H132 is a well-reviewed, versatile, and effective non-ionizing air purifier for small rooms. It has a three-stage filtration system: a pre-filter, an activated charcoal filter and a true HEPA filter which work together to eliminate dust mites, pollen, mold spores, pet dander and smoke. It is small and quiet enough to operate continuously throughout the night, and its modern design means it won’t look out of place in any home or office. This air purifier is a compact, stylish and quiet three-stage design which can remove particles as small as 0.3 microns and air pollution as small as PM2.5. It comes with a 2-year warranty and unlimited manufacturer support. It also features a light-up control panel on top of the unit which can be dimmed or turned off at night for added comfort. Its non-ionizing filtration system does not generate dangerous ozone emissions, keeping your family safe from the effects of air pollutants without creating any new ones. This unit is fairly small, and comparable units at a similar price point are capable of purifying a much larger area. Additionally, the HEPA filters must be replaced at minimum every six months whereas the HEPA filters on competing units (VEVA 8000 Elite, AeraMax 100) only require replacement every 12 months depending on usage. Some reviewers also pointed out some quality control issues, although these were promptly responded to and the units replaced by the manufacturer. This model is especially suited to smaller, more elegant spaces – it is suitable for rooms measuring up to 86ft²/8m². Its quiet operation and smaller capacity make it an ideal choice for small offices, bedrooms and rooms where an unobtrusive purifier is a must. The dimmable nightlight functionality of the unit makes it especially well-suited for children’s bedrooms. This powerful unit combines a 3-stage non-ionizing filtration system to filter dust, pet dander, pollen and bacteria. An activated charcoal filter and a mechanical filter help to prolong the life of the HEPA filter, and extra care has been taken in its design to ensure its safety – this purifier is both ETL and UL certified and comes equipped with an automatic shutoff feature when the front panel is removed to change the filters. The VEVA 8000 is one of the largest-capacity non-ionizing air purifier in its price range, keeping an area of up to 325ft² smoke and particle-free – more than both the Aeramax 100 and the Levoit LV-H132. It comes with a removable tower base, allowing it to be positioned sideways in a tabletop configuration, and its long filter life means that you can go up to 12 months between filter changes, even in smoky rooms. Because it moves more air through its filters, this unit is not as quiet as the Levoit or the Aeramax when running at full capacity. Although the HEPA filter lasts a year, the carbon pre-filters must be changed every three months (a one-year supply is included). The VEVA 8000 is a high-capacity unit and looks the part. While it’s not a utility-grade machine, it is designed to serve function over fashion and its capacity comes at the expense of design and lower sound levels. It is good for large rooms in which an effective and portable air cleaning and smoke removal solution is required and unobtrusiveness is a secondary concern. 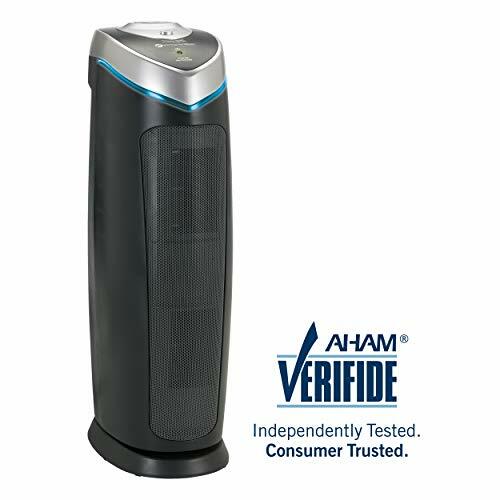 The AeraMax 100 is an extremely well-reviewed unit that combines large area coverage with superior air purification. The filtration system is a four-stage arrangement – pre-filter, activated carbon filter, HEPA filter and the AeraSafe anti-microbial treatment which prevents buildup of mold and bacteria on the HEPA filter itself. Although it contains an ionizer, UL testing has shown that like theLevoit and the VEVAthis unit does not generate any additional ozone. The Aeramax can clean smoke and particles out of an area of up too 200ft², and its anti-microbial treatment has earned it an endorsement from the Asthma and Allergen Society of America. 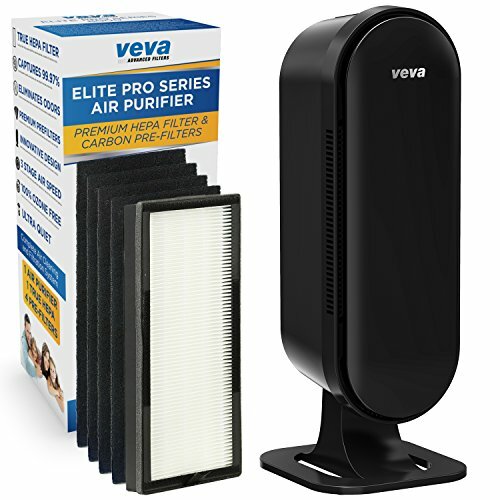 It effectively clears smoke and particles as small as 0.3 microns from the air, and its filter life is up to 12 months for the HEPA filter and 3 months for the activated carbon filter. Additionally, the Aeramax automatically adjusts its output to match the ambient air quality using the built-in Aerasmart sensor – fan speed is increased and decreased as the air quality changes, meaning you don’t have to constantly adjust the settings every time the wind changes on a particularly smoky day. Some reviewers didn’t appreciate the “light show” on the front of the unit – the lights change color automatically as the air quality changes, and this can draw more attention than some users care for. Additionally, this unit is considerably louder than some others, and many reviewers have pointed out that the ionizer produces a high-pitched whine when it is in use (it can be turned off with the push of a button). This unit is good for areas in which smoke removal and air purification are more important than quiet. It offers the best in class filtration, combining the best of the Veva and the Levoit’s filtration with an ionizer to generate excellent air quality. It doesn’t have the capacity of a commercial unit, but it does have the filtration and smoke removal quality of a much more expensive machine. Clean air is essential for human health, but various pollutants impact the quality of the air we breathe every day. Air purifiers are designed to rid households and office spaces of a number of these contaminants. The type of air purifier you need depends on what sort of pollutant you are trying to eliminate, as different filters and technologies will work against different things. An air purifier is particularly indispensable in the home of a smoker, helping to reduce the smell of cigarettes and some of the harmful components of second-hand smoke. They can also reduce allergy and asthma symptoms by filtering mold spores, pollen and pet dander out of the air. Living in areas exposed to higher levels of pollution such as crop sprays or industrial fumes can be very detrimental to your health. Small, enclosed spaces like apartments trap airborne smells and particles more easily than larger spaces. Research indicates that the air inside homes can be more seriously polluted than outside air – even in large industrialized cities. It is also common in apartment dwellings to encounter unpleasant smells from neighboring units, be it from rubbish or cooking or smoking. An air purifier can prevent these smells from spreading throughout your home. Children and the elderly are more susceptible to respiratory illnesses, which are exacerbated by poor air quality. Emissions from motor vehicles are a common and dangerous air pollutant, which can have serious long-term impacts on human health. Respiratory, skin, immune system and cardiopulmonary health can all be improved by breathing better quality air. Air purifiers can also have added benefits of removing odors and toxins from carpets – a great bonus if you are living in a rental property and/or have babies or toddlers. Using an air purifier in your home or office reduces your exposure to these pollutants and betters your overall health, wellbeing and quality of life. The negative impacts of cigarette smoke range from being a mild annoyance – perhaps some residual odor on clothes or hair – to being a serious, cancer-causing health risk. Cigarette smoke contains thousands of nasty chemicals, including ammonia, cyanide, carbon monoxide and lead. It is the single biggest cause of preventable cancers in the world. Secondhand smoke is a dangerous form of air pollution, contributing to about 3,000 deaths in the United States per year. Smoke from wildfires can also pose significant health risks. While it is made up of mostly water vapor, it contains small particles of carbon monoxide, nitrogen oxide and other toxins. People with existing heart or lung diseases are at significant risk, as are young children, the elderly and pregnant women. Those living near active wildfires might experience symptoms including chest pain, sinus issues, and itching or burning eyes. It can also increase the risk of asthma attacks. Air purifiers are built with a combination of specially developed technologies, using fans to pull air through filters to automatically extract and capture particles. This removes smoke odors, toxins and other debris. The result is the circulation of clean, healthier, purified air. Pre-filter: The pre-filter is the frontline defense in an air purifier. It catches large particles and helps to maintain an air purifying unit by preventing debris from getting to the primary filter technology. These have a longer lifetime than other filters because they can be washed and reused. It is a good idea to do this regularly (once a month) to keep an air purifier running well. True HEPA Filter: HEPA stands for High-Efficiency Particulate Air or High Energy/Efficiency Particulate Arresting. This means a HEPA filter is incredibly efficient at capturing microscopic particles. A True HEPA has strict standards set by United States Department of Energy, and must be able to catch 99.97% of particles as small as .3 microns. There are two types of True HEPA, a highly dense degradable paper filter (requires replacing) and a mesh HEPA filter that can be washed and reused. BioGS HEPA Filter: This filter developed for Rabbit Air purifiers meets the True HEPA standard and has the additional benefit of reducing buildup of common allergens, by restricting the growth of bacteria and viruses on the filter. They can last up to 3 years. HEPA-type Filter: HEPA–type filters do not meet the required standards to qualify as True HEPA, and false HEPA marketing often fools buyers. These filters are not guaranteed to be as effective as True HEPA, so be careful when selecting your product to ensure you are getting the genuine article. Activated Carbon Filter: The charcoal used in these filters is activated by being heated to around 1550°F (approx. 840°C). Activated carbon filters have proven to purify air more effectively than standard filters, as they can remove smaller particles. The material is highly absorbent for odorous airborne contaminants, especially those of an organic nature. They cannot be cleaned and must be replaced as required. These are also known as activated charcoal filters. Ion Generator (or Ionizer): An Ionizer emits electrically charged ions, which bond with contaminants in the air. This makes the particles become too heavy to remain airborne, so they fall to the floor or are collected on a collection plate (if the purifier is equipped with one). This is quite a different method from filter style air purification and does not trap and remove pollutants from a household in the same way. UV-C Light: UV lighting is a type of radiation that cannot be seen by the human eye, as it is part of the invisible section that makes up the electromagnetic spectrum. UV-C light is a powerful form of radiation that is harmless to humans (unlike cancer-causing UV-A and UV-B), but excellent at killing germs, viruses and other microorganisms. Ozone: Referred to as “trioxygen”, ozone is made of three oxygen molecules bound together. The type of oxygen humans breathe is “dioxygen”, made with just two. The third oxygen molecule makes ozone unstable, and it will easily attach to pollution and smoke. After it attaches to the pollutant, the substance is destroyed. While this makes for an effective air purifying solutions, ozone is hazardous to human health. It’s highly reactive nature does not deplete once it is inhaled. It continues to react inside the human body, most commonly causing damage and infections in the lungs. It is for this reason that ozone-emitting purifiers are no longer recommended for use in the home. It's hard to get rid of smoke around the house. Inside we detail a cheap and effective way to get rid of smoke without breaking the bank.